Q - We are receiving an Error 161: The maximum number of user count licenses has been reached. This happens to all users when starting up Elliott. We have rebooted all office computers and the PSQL server. There is no one is in Elliott. Yet we are still getting this error (we tried opening Elliott on only one computer). Everything was working fine yesterday. A - The likely scenario to cause this to happen is that your PSQL license has become disabled or expired. 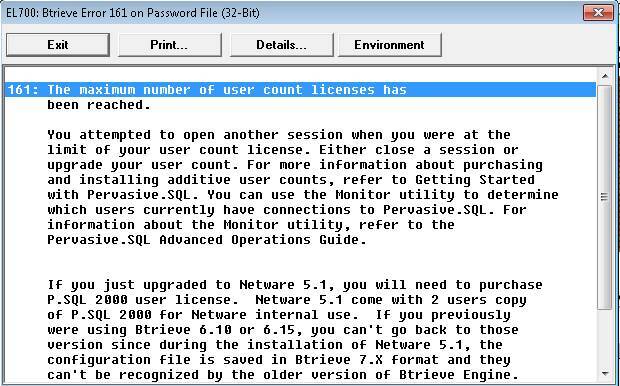 You should go to your PSQL server console and bring up the Pervasive License Administrator utility. See attached example below. Check the PSQL license entry to see if it has been "disabled" or "expired." The PSQL server license can become disabled because the underlying hardware has been changed. For example, if you upgraded your PSQL server to a new hardware box by using backup and restore, the PSQL server noticed that the underlying hardware changed. At that point, its copy protection mechanism will disable the PSQL license until you resolve this issue. If you can't repair the PSQL license key yourself, then you will have to contact Netcellent. Keep in mind that if your PSQL is installed on a virtual server, it is likely to exacerbate this problem. In the virtual environment, it is very easy to change memory size and allocate more CPU units to the virtual server. This can potentially disable your PSQL license. Also, in the virtual server environment, you can perform live migration, which is to move your PSQL virtual server from one hardware box to another. This will also disable your legacy PSQL license unless you have a special PSQL Vx license installed. When upgrading to a new server, many of our users simply install PSQL on the new server without installing the license key. PSQL comes with a 30-day free trial. So you may not even know you are running on a trial license until the license expires 30 days later. If that is the case, you will simply transfer your PSQL license from the old server to the new server by using the license administrator utility. It is also possible you ran out of PSQL user licenses. But if that's the case, you should not receive Error 161 for every single user after you reboot the PSQL server and there's no one else in the system. If you indeed exceed your PSQL user licenses, you simply have to give us a call to purchase more PSQL user licenses. Do I Need to Change PSQL Server Engine Default Parameters After Installing It? Can I Dynamically Adjust Elliott / PSQL 11 Server Memory? How Do I Turn on PSQL Relational Engine Security? What Is the *.^01 File for My PSQL Btrieve Table?